I am a keeper of bees, but, not a beekeeper. There are no honeybee hives in my garden, although, honeybees regularly visit. Several neighbors have hives and I like to think their honey is Clay and Limestone tasty. I am the keeper of this habitat called Clay and Limestone. It's become my life's work. Providing a healthy habitat for native bees and other pollinators has been important to me since the Autumn day I noticed that the garden was filled with buzzing critters. They were nectaring on the ex-asters that lived on the edges of the yard tucked under the shrubs. I had forgotten all about them while I struggled to grow plants that made no sense for this shallow soil. The plants were alive with activity, there were tiny bees of many kinds, flies that looked like bees and wasps, and bumbles of every size. It was a native plant wake up call and it didn't take me long to fall head over heals for the critters and the wildflowers that brought them to the garden. You could easily say that wildflowers opened my eyes to all the critters that live in and visit this garden. I noticed which plants they nectared on, which plants they needed for raising their young, and, which plants had nuts, fruits and berries for the birds and small mammals. I planted as many as I could pry into the shallow soil. Once you have a garden filled with native plants, you can't help but notice that there's always something happening. Birds are bathing or drinking at the baths; spiders are building webs to collect unsuspecting insects; beetles are mating; and, the bees are everywhere. I enjoy all the critters (okay, I am not too crazy about the voles, they keep eating my favorite plants) but, the pollinators, especially the bees, have a special place in my heart. Pollinators are active as soon as there are blooming flowers. Here that means small flies will be buzzing around the late winter blooming witch hazels in January. It gets busier when the spring ephemerals bloom and the mason bees and honeybees arrive. From then on, bumbles, green metallic bees, mason bees, big and tiny carpenter bees, sweat bees, flower flies, beetles, moths, butterflies and skippers are busy visiting anything that offers nectar and/or pollen. 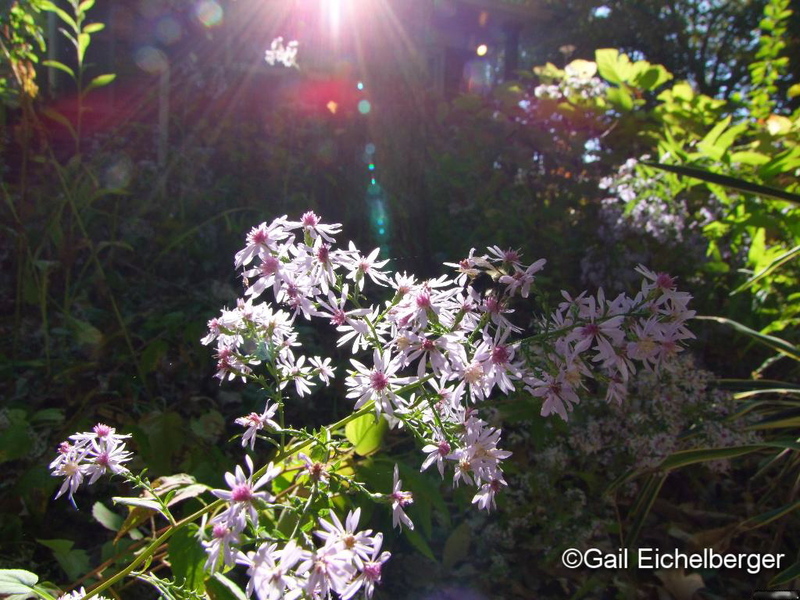 But, come fall, the rush to get ready for winter ramps up the activity and the little ex-asters, which are some of the last natives blooming in this garden, are covered with every kind of pollinating creature. Autumn is a delightfully magic time. 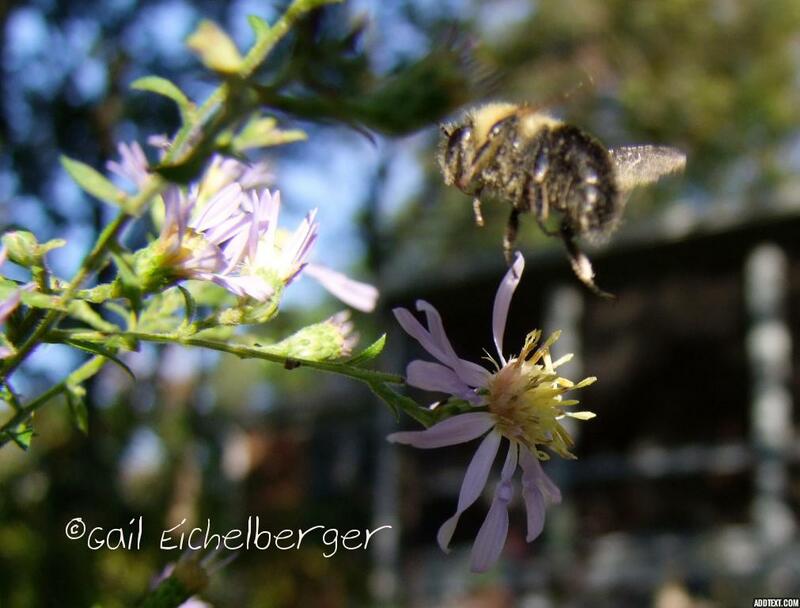 You can be a keeper of native bees and other pollinating critters, it's not difficult at all. *Plant host plants~don't stop at nectar and pollen plants. A healthy garden is diverse, so plan for all the critters that live or visit. The Monarch butterfly is a great example of a pollinator that needs a specific plant, in this case milkweeds, in order to reproduce and live in your garden. Some bees have plant preferences, but most are generalists and are happy visiting any flowers. *Plan for bloom from late spring to early winter. Since bees are most active from February to November (longer in mild climates) late winter blooming Hamamelis vernalis and the earliest spring ephemerals (like the toothworts, hepaticas, spring beauties and False rue-anemone) are perfect plants for a variety of pollinators. *Bee sure to include water. Shallow birdbaths, mud puddles or even just a small saucer with sand and rocks helps supply pollinators with the necessary water and minerals they need when ever they are out and about, but, especially in the long, hot, dry summers that many of us are experiencing. *Provide nesting sites for a variety of visitors. Leave a three foot square of bare soil for ground nesting bees and ix-nay on the plastic landscape cloth~bees cannot tunnel through it. Leave decaying logs for beetles and tunneling bees. Build or purchase specialized bee houses. Trust me, building your own Pollinator Condo is a fun project! *Wait until spring to clean up your garden. Get over thinking that fall means garden clean up time~spring cleaning makes sense! I leave dried flower stalks and grasses standing all winter for hibernating insects. Did you know that many beneficial insects overwinter in decaying leaves and in plant stalks? The one exception is summer phlox~I always cut down and dispose the stalks in the trash to keep the phlox bug from over wintering and decimating the plant the next season. *Practice peaceful coexistence. Bees sometimes choose to nest in inconvenient places. Rather than exterminating them, think of it as an opportunity to watch and learn about them up close. As a gardenblogger, I consider educating others about native bees to be an important job. If you want to help, here's a few things you can do. Share your knowledge through your blog. Talk to your gardening friends. Invite native plant experts and ecologists to speak to your garden clubs. Request pesticide free plants at garden centers and/or refuse to shop at nurseries that can't or won't acknowledge whether or not their plants are treated with pesticides that are known to be harmful to pollinators. *Of course, you all know that the very best thing you can do for bees and other pollinators is to never, ever, ever, ever use pesticides! Welcome to Wildflower Wednesday and thank you for stopping by to see the native ex-asters and their happy pollinator visitors. October is the best time to see clouds of lilac blue flowers in my garden and I have been thrilled to see that they have been blooming and attracting pollinators despite the drought that has been a challenge most of the summer and fall. It seemed only right to share all those lovely flower faces and the pollinator visitors with you for October's WW post. I hope you enjoyed this post as much as I have enjoyed writing it and finding the best photos to illustrate my points! You have seen some of the photos from previous seasons, but, the critters and stellar flowers are in the garden today. Symphyotrichum is a genus of about 90 species of herbaceous annual and perennial plants that were formerly treated within the genus Aster, but, are now known officially at Clay and Limestone as the ex-asters. The ex-asters* in my garden, Symphyotrichum shortii, S cordifolium, S laeve var. laeve, S novae-angliae, S oblongifolium, S patens, S pilosum, S praealtum, S priceae are all endemic to Middle Tennessee and grow and thrive in the clay soil and semi-shady to almost full sun conditions of my Zone7 garden (formerly Zone6b). Symphyotrichums are found all over North America and there are many that will grow in your garden. Many kinds of insects, especially long-tongued bees, small-tongued bees, butterflies, skippers, and flies are attracted to the pollen and nectar of ex-asters and several bees are known to specialize on them. I was excited to learn that the cats of the Silvery Checkerspot and Pearl Crescent feed on the foliage. One can conclude from the long list of critters that feed on all parts of ex-Asters that they have good wildlife value! (Illinois Wildflowers) *Not all of the ex-asters named are shown in this post. Thanks for joining in and if you are new to Wildflower Wednesday, it's about sharing and celebrating wildflowers from all over this great big, beautiful world. Join us on the fourth Wednesday of each month. Remember, it doesn't matter if your wildflower is in bloom or not and, it doesn't matter if we all share the same plants. Please leave a comment when you add your url to Mr Linky. I aspire to be as thoughtful in my plant choices as you. I welcome and encourage seedlings of the wildflowers that volunteer in my garden. The bietou bush I see on the verge as I stand here certainly supports our caterpillars, as it grows with enthusiasm just beyond the urban edge. Our wild honey bees scout for flowers that are about to bloom ... and raise that many young bees in their nursery. Within the hive the honey is sorted by flower type, but that all blurs together once we harvest a jar of honey. Great advise. I am glad you are feeling better. I can see that you are by the length of your post. Bee well so you can see all of these great creatures in your garden. I love, love this post. It just sings to my heart. Gail, you and I are on a shared mission. One of these days I want to sit in your garden with you and take in all your garden goodness. So, I actually got organized this month and have a post to participate in WW! Awesome post, jam packed with great information and encouragement! We are not seeing as many insects here, now that the blooms are about finished, and the nights are dipping into the 30s. It's pretty chilly here and most pollinators have wisely gone into hibernation or whatever they do to get through the winter. The plants they love have gone dormant, so I decided to write about the exotic species that are more obvious this time of year. Great post as always and your pictures are wonderful. I've posted, too, about my fleabane and fall garden clean up. A beautiful collection of creatures, Gail! This month, you and I are in perfect sync in our ex-asterness. Beautifully written, beautiful photos. Thank you for sharing! Wonderful article, Gail, and such great advice for both more experienced gardeners as well as those that are just starting their journey with ornamentals, like myself. While I don't have a mostly native garden like you do, I still have lots of goodies that attract pollinators. I have so many different buzzing creatures here, just like you do. We're having a little late autumn warm spell, and they've all reappeared for feasting! One of my friends recently explained to me that actually most of the insects are actually not so dangerous as I thought. This season I decided not to remove most of my summer plants in order to give a better chance to our little fellas.